Tonight's red post collection includes a small 6/9 patch update , the fourth installment of ASK RIOT, a reminder that Hexakill: Twisted Treeline returns in the rotating game mode queue this weekend, a mystery figure sale in the merch shop, and more! Red Post Collection:State of the Season, RGM Brain Dump 2, API Challenge 2016 Winners, and more! ROCKY REJUVENATION - Fixed a bug where Mountain Drake's buff significantly reduced the healing effectiveness of some abilities (ex. Fiddlesticks's W - Drain) against epic monsters"
"Also fixes Warwick, Irelia, Yorick, and Blade of the Ruined King when smacking epic monsters, for those curious." What is next with Rotating Game Modes, what to do with all that IP, and why we use percent health damage are up for this week. Have a question (or two...hundred) yourself? Head over ask.leagueoflegends.com and sign into your League account. Check out the Do’s, the Don'ts, and then ask us something. We’ll archive the answers once we’ve accumulated a few of them. Some questions may be answered elsewhere or won’t be right for Ask Riot (we won’t be launching new products here or taking away from existing conversations, for example you can check out the round table video for information on Dynamic Queue). Even if your question isn’t the one being answered, we’re listening, and we’ll be sharing your questions with the Rioters who are working directly on the things you’re curious about. When will we see new game modes in RGM? We're still forging the path at the moment with our current stable of modes, and we’re carefully looking at how each one is received and how people are engaging with it. Unfortunately, we can’t tell you exactly when your favorite mode, like say Doom Bots, is coming back but we can talk about how we’re selecting each mode to include in RGM. So far the modes we’ve included in RGM represent the widest spread of gameplay with strong engagement, URF for example, is a mode we consistently hear about from players, which is why we chose it among our first releases. That doesn’t mean RGM is a popularity contest. Any game mode that we've previously released is a potential candidate for the RGM queue. If your favourite mode isn't in there yet, there's a chance it will be eventually. Have you thought of alternatives to spend our excess IP? (something different from champions and runes)? We are definitely looking for opportunities to add new ways to spend IP. We frequently release limited-time summoner icons for IP, and recently added a major new outlet for IP that we believe will be compelling for many. 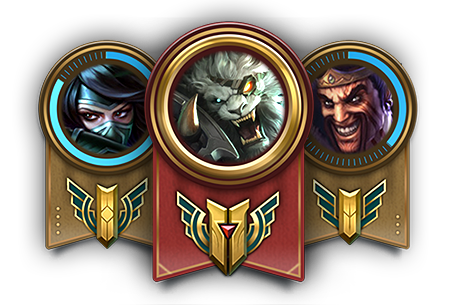 Our latest foray was champion mastery levels 6 & 7, which grants players new mastery badge emotes, new loading screen border flags and announcement banner upgrades. This enables players to show off their favorite champions through a combination of skill and investment. We wanted to make sure the rewards were accessible to all of you so we added the ability to use IP to get them. Why include percent health damage in a champion’s kit? Is it simply a response to the tank meta? 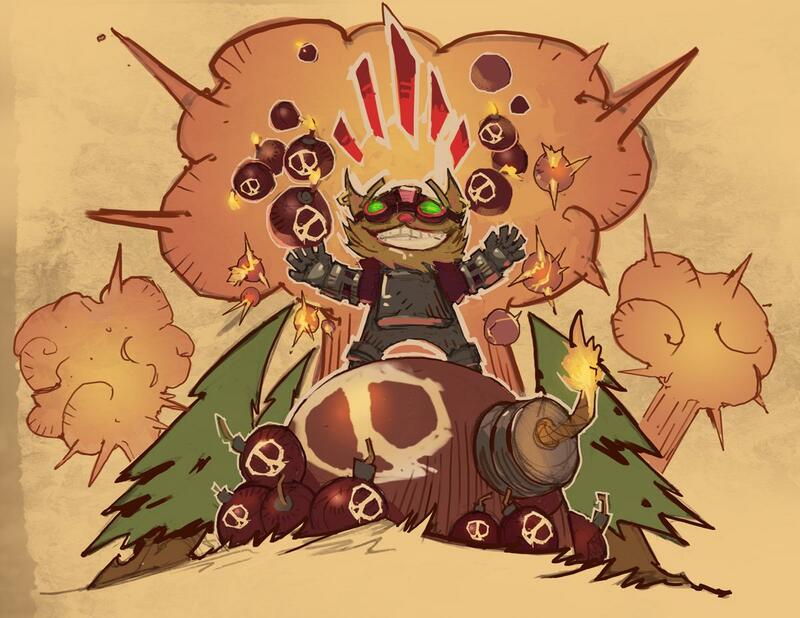 Or do you want to design every champion to always feel like they can do at least a bit of relevant damage even if they are full tank or utility because you have found this to be more satisfying for the player? Current health is typically used on tanky champions we want to soften up targets and set up allies for success (think Jarvan). 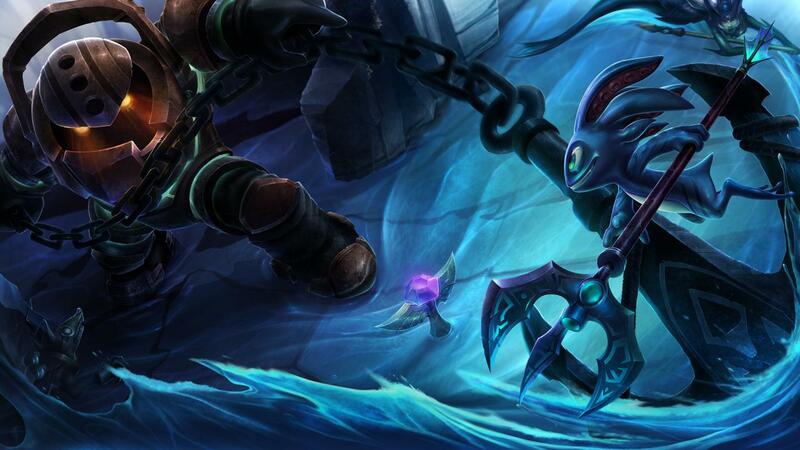 Missing health works best when we want champions to deliver the final blow – assassins fit well here – such as Fizz. Maximum health is when we want a champion to be a threat to all enemies. Think of a fighter or skirmisher like Fiora, or for a specific ability that should always be a threat, Tahm Kench’s Devour. 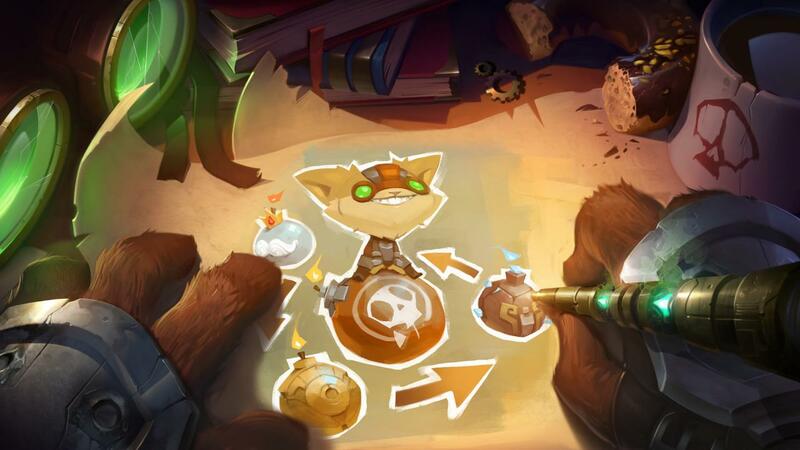 A similar-looking but very different mechanic is used with abilities like Veigar’s ultimate that multiply the ability’s damage with the percentage of the enemy’s missing health – but don’t actually consider the enemy’s raw health values. This is a big difference because this ability won’t scale in damage as an enemy’s max health increases. It’s worth noting this is a less-powerful mechanic as the ability has a hard cap on how much damage it can deal, such as double or triple the base damage. We like using this when we want an ability to feel great as a finishing move, but don’t want to be drastically changing who the champion is strong or weak against. Veigar and Riven both use this mechanic on their ultimates. Veigar excels at blowing up squishy targets (hence why marksmen so frequently flee the scene when he’s around) but struggles versus super tanky champs who can shrug off his ult. The amplified damage means he can more likely get the final blow on a champion but he’s still incentivized to use it on squishy enemies because at best, you are dealing twice the base damage which a tanky enemy simply won’t care about as much. Is there any chance of the RGM being available full-time rather than just on weekends? The RGM queue has been quite healthy, so we're investigating extending it to Monday going forward, making for a total of 4 days each weekend. As with all things, this is subject to change (you never know sometimes with gamedev) but we're looking into it right now. Soon(tm)." Hexakill: Twisted Treeline returns this weekend in the rotating game mode queue! 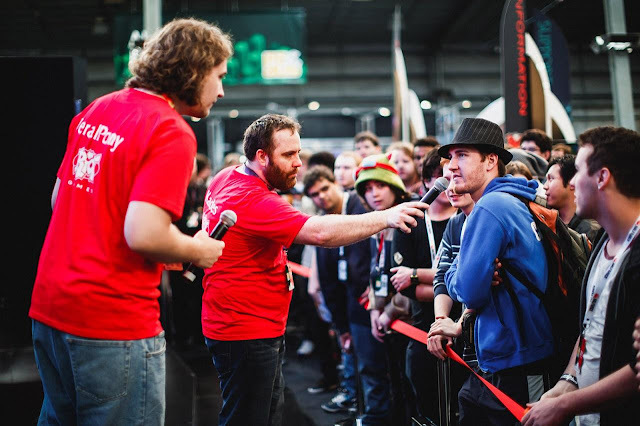 As usual, look for things to start up around NOON (12:00 PM) server time! The updated rotating game mode queue schedule is also out! 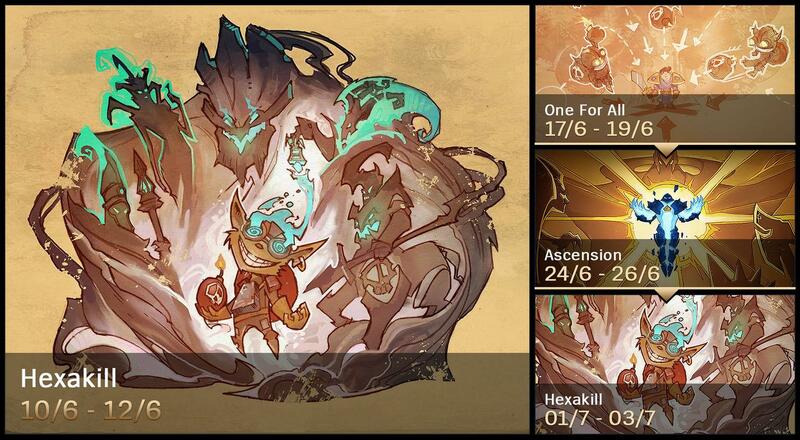 Next weekend from June 17th through June 19th One for All will return, followed by Ascension on June 24th - 26th, and Hexakill: TT repeating again July 1st through 3rd! "From the original clone-tastic One For All to the sand-strewn battlefield of Ascension, rotating game modes provide unique spins on the classic League formula. It’s time to kick things off with the next game mode in the rotation: Hexakill: Twisted Treeline is now live! Hexakill: Twisted Treeline is now available and lasts through the evening on Sunday (we’ll shut it down very early Monday morning--usually between 1:00 AM and 3:00 AM). We’ll be trying out different things with the rotating game mode queue over the next few months, such as potentially turning it on longer depending on how popular it is, changing the mode cadence or what modes are available. We’re looking for your feedback as we go, so let us know. GLHF, and we’ll bring a sixth man alongside you in the Twisted Treeline this weekend." 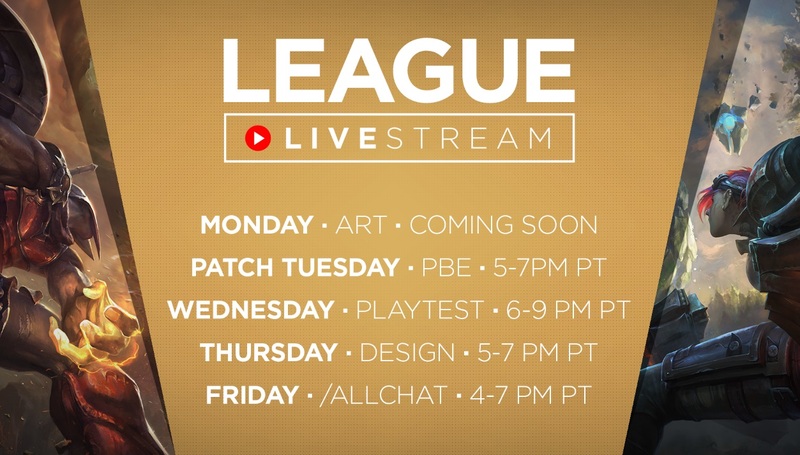 In case you missed it, be sure to check out the VOD of the recent design live stream with Scarizard and systems designer Riot Goatscope! The crucial job of ward clearing can turn deadly if IT'S A TRAP! Veevix and friends tempted the most passionate vision-deniers with a juicy trail of Farsight Orbs leading to a bloody end. What’s your favorite way to bait your opponents? Let us know in the comments below!" Series 1 Mystery Figures are now available in the shop! For a lower price than usual, you can pick up a random champion figure that has already been released! "Complete your collection before Series 1 is gone. Unlock a random Series 1 figure from remaining in-stock figures for $15"
"Series 1 = all except Firecracker Jinx & Urf (Series 2). Mystery Figure applies to any Series 1 figure that's in stock"
In case you missed them when they were first available as 6.11 went live, here's a reminder that the Hextech Mystery Champion shards are now available in the shop for 1700 IP or 195 RP! 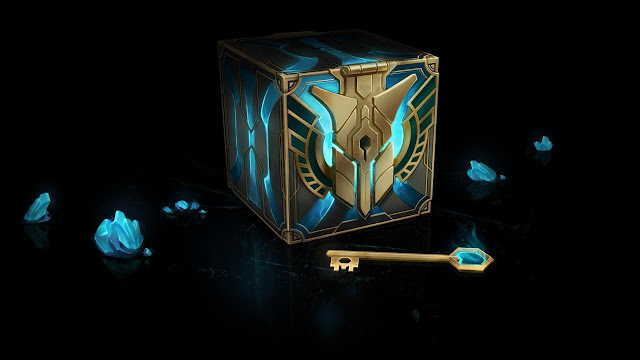 Pick up Hextech Mystery Champion Shards for 1700 IP or 195 RP. Questions? Let us know below!" Last up is a new episode of /ALL CHAT! "This week, ALL Chat shows off the sexier side of some champions and discuss which League champs put the OP in OTP. Whether you’re a fan of Rengar and Nidalee as king and queen of the jungle or Vi and Cait are more than partners on the beat, we want to hear who do you ship? Josh Kim is responsible for the awful OTP joke."